I used to love drawing at school and recently picked up my pencils again after 35 years. 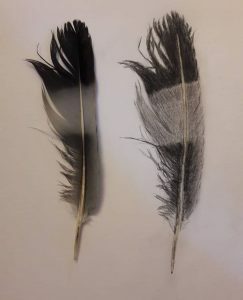 This was my first attempt at drawing a feather and the result immediately reminded me of someone with poor mental health. At a first glance it looks okay. But on closer inspection something isn’t quite right. It isn’t in the best of shape. It doesn’t look vibrant and alive. And this got me thinking about how good people are at hiding their problems so that, on the surface, they look as if everything is fine. No one knew about my drinking issues and the internal turmoil that caused them. I still looked after the family and did my job. I still smiled and laughed and made jokes. It’s a lonely, isolating business, having a mental health illness and if you know someone who’s suffering here’s what you can do – and these points are for me just as much as anyone. Just because I’ve “been there” doesn’t mean I don’t need reminding of how I can best help someone else who’s struggling. Empathy is about LISTENING and not necessarily trying to fix things. I find this personally very difficult, especially as a parent – if someone’s having a tough time I want to jump in and immediately start offering what I think are solutions. But more often than not people just want to talk and be heard. That’s all. It’s about giving them the time and space to do this. It’s about simply saying that’s tough, I’m sorry to hear you are suffering – I’m here for you. It’s about giving hugs – that emotional and physical support means so much. See the illness for what it is – something separate. If someone breaks their leg, you see that as something separate to the patient and it should be the same with mental health. If someone has depression or anxiety or whatever, that person is still there, somewhere inside – the mental illness is a medical problem they are suffering from, it’s not them. My drinking and eating disorder issues, caused by my mental health problems, made me isolate. Made me lie. Made me over-sensitive. Defensive. Made me emotional. Tearful… in the same way a broken leg might make you walk funny or wince in pain or not be able to get out much socially. If you can see the mental illness as a separate entity that might help you have more empathy if you are finding that difficult – because the mental illness of others is difficult to live with and you shouldn’t be hard on yourself for having conflicted feelings about this. Poor mental health can feel impossible to understand. Back in the day I even had a doctor tell me to simply eat normally. Irrational behaviour is difficult to explain and can lead to frustration and impatience growing in people trying to help. And I get it. There’s nothing worse than feeling helpless in the face of someone you care for being so unhappy. But try to see the anxiety – or whatever the problem is – as a beast your loved one is trying to tame, as opposed to being part of them. Whilst just listening is crucial, if you feel the time is right, don’t feel afraid to nudge people towards treatment options. Although this has to be well-judged. With any mental illness – especially addiction – the patient, him/herself, has to acknowledge they have a problem and get help. They have to be ready. But – going by personal experience where I’ve helped people – there is nothing wrong with subtle suggestions, over time, to plant the seeds of an idea that maybe a visit to the GP or counselling could be helpful. Don’t be so forceful, don’t put so much pressure on that you scare the person away, but at the same time make it easy for them to access the information they need. Perhaps leave some leaflets lying around or message them a couple of links and leave it at that for a while. Don’t give up on them. For the last couple of years I’ve cancelled no end of engagements. Pulled out at the last minute. Said yes but meant no. Yet still friends and family ask me out and I’m grateful. Try not to take it personally if someone pulls out of an event. It won’t be that they don’t want to see you or don’t see the invite as something important and appreciated. If they rang up and said they’d been struck down by gastric flu you’d understand. Try to accept that a sudden bout of anxiety or low feelings is no different. As author and mental health advocate Matt Haig is always saying, physical health, mental health, it’s all part of the same. Very importantly – think about your own needs. Firstly, you are no good to anyone else if you don’t look after yourself and become ill… but secondly, and more importantly, you matter too. It can be draining and emotionally challenging being there for someone who is sick. Sometimes you have to be put yourself first in order to keep well. Indeed, this mindset helps me maintain my recovery. A couple of times over the last year or two I have had to distance myself from people who are ill because it might threaten my own mental strength and sobriety. This is not selfishness – it is self-care. Or, as we call it in the addiction world, keeping yourself safe. Lastly, I would like to thank anyone reading this post who supports – or is considering offering support to – a friend or family member in need. Give yourself a big pat on the back. It is all too easy to turn a blind eye, to take the easy route and not get involved. You never know if one day you too might end up needing treatment. I know that better than anyone and during those times it is the patience, the understanding and love of people that matters most. This entry was tagged alcoholism, anxiety, depression, eating disorder, empathy, mental health.